The Asus Lamborghini VX2 (£1,999 inc. VAT) is all about making a statement, as the yellow plastic back to the screen creates a visual link with the cars. Open it up and the VX2 continues to stand out from its peers thanks to the leather palmrests, complete with yellow stitching. The Asus comes with a wealth of Lamborghini-branded accessories, from a travel mouse to a matching leather briefcase and mousemat. Although everything is well made, it is slightly garish. Asus has also pulled out the stops when it comes to regular accessories, fitting everything from a fingerprint scanner to a 1.3-megapixel webcam. An 802.11n wireless adapter is also fitted, offering the quickest possible connection speeds to wireless networks. Dig below the Lamborghini facade and there's a very good laptop here. The screen is simply stunning. It does reflect in bright conditions - as do all displays with a Super-TFT coating - but keep it clean and images couldn't be more bright and colourful. We found photographs and games looked crisp and detailed, and there's also plenty of space on the 15.4-inch screen. Asus has got the best out of the screen by fitting the latest mid-range graphics card, Nvidia's GeForce Go 7700. An update of the 6600, this card offers more performance, and we had no trouble at all playing the latest games. That said, you may need to reduce resolution or detail settings on upcoming games. The widescreen layout creates plenty of space for a good keyboard. The keys are large and feature a well-judged action, making it a comfortable machine to type on. They're not as well attached as some, however, rattling under use. The chassis itself is strong and capable of withstanding everyday use. Even after long periods the leather palmrests remained cool to the touch. The screen is firmly attached, although there's no catch to keep it closed in transit. When we did take it on the road with us, we managed to get around two-and-a-half hours between charges. At 3.3kg, it's not the lightest machine and it's also quite bulky. As befitting a Lamborghini-branded product, performance is impressive. 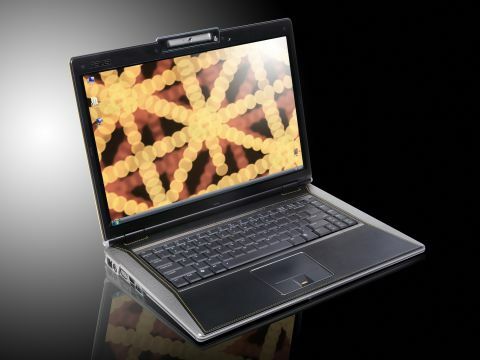 Intel's Core 2 Duo T7400 (2.16GHz) processor is fitted, which is a high-end chip. With 2048MB of memory to store data, this is a rapid and smooth running system, with more power than most users will need. All of the applications we used ran with little or no lag. The VX2 is a good laptop, but aside from the unique branding it doesn't offer anything genuinely innovative.